Part 1 of our Finance Transformation blog series. Read Part 2 here. 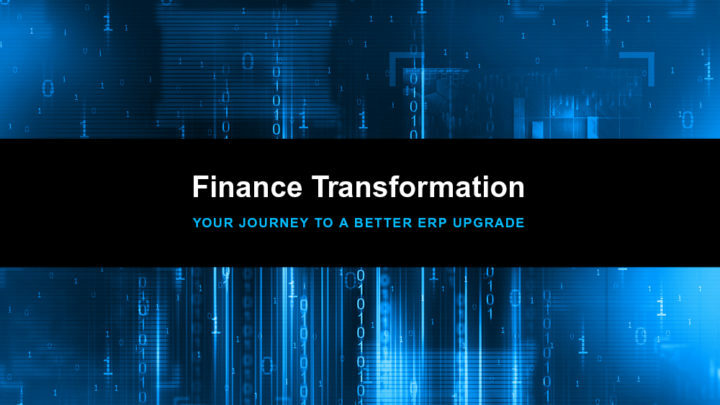 There is a growing expectation for finance leadership to make a shift toward digital transformation and upgrade the ERP environment. The average age of a typical ERP instance is now between ten and fifteen years. Most are IT-owned, haven’t kept pace with today’s modern workforce, and are difficult to change – requiring increasing manual effort. The new wave of ERP is more agile, mobile, and adaptable, and for most organizations, an upgrade is long overdue. According to McKinsey, just 30-percent of CFOs say they are prepared, and accounting only has time to even think about an ERP-upgrade during the brief window each month when they’re not committed to closing the books. These three significant issues can jeopardize ERP upgrade success. The accounting team is instrumental in the success of an ERP upgrade. They will spend time in the system every day. But they are already stretched to capacity, with little time left to invest in the upgrade. As a result, IT is left handling the business process design decisions on its own. Analysts estimate that around 55 to 75 percent of all Enterprise Resource Planning (ERP) initiatives will fail to meet their objectives, and this is a primary reason why. If the ultimate users aren’t part of the upgrade discussions, how can the organization ensure that the right choices are being made? Change is perceived as risk for accounting and finance professionals, and many believe that staying with the status quo is the safest choice. As a result, legacy processes are often migrated over—hindering the new ERPs potential impact right from the start. An ERP upgrade offers new possibilities for process reinvention and improvement, and redesigning your current processes first will lead to optimal efficiency in the long run. During an ERP upgrade, there is an increased risk of disrupting close and reporting processes. The transition period opens the door to master data changes and data migration concerns, among others, and ironing out the kinks in the upgraded system can slow down the financial close. Additionally, substantial changes in underlying processes create financial statement risk. Process automation is the key to creating the time your teams need to invest in the upgrade. By implementing the right technology first, accounting and finance can gain rapid wins by cutting time spent on manual close tasks (like reconciliations), achieving faster time-to-close, and improving balance sheet integrity. Enterprises who put an automation solution in place first are better positioned for an optimal ERP upgrade experience. In fact, Gartner reports that 80-percent of large enterprises in North America and Europe are predicted to use this strategy to unlock accounting efficiencies and lower risk, as their first step to renovating their ERP. Read this white paper to dive deeper into this smarter way to upgrade, and learn how to free your accountant’s time by 50%.